That’s right. The Corps’ environmental justice analysis only looked at the impact on a predominantly white community mostly upstream from where DAPL crossed under Lake Oahe. It did not consider the impact on the Lakota people of the Standing Rock Nation just downstream from the crossing — the community that would be impacted by any spill. The Corps defined the environmental justice study area as circles with a half-mile radius around the two pipeline bore holes on either side of Lake Oahe. Using that definition, analysis took into account only two census tracts: one in Morton County and the other in Emmons County. It left out Sioux County and the reservation. The Standing Rock Reservation is 0.55 miles — or 80 yards beyond the 0.5-mile limit — downstream of the HDD [horizontal directional drilling] site, and the Tribe contends that there was no principled basis on which to narrowly exclude it from the bounds of the Corps’ analysis. It also notes that the two census tracts selected as the “affected area” are “mostly upstream of the crossing site” with a 98% white population. Comment: It’s probably no coincidence that DAPL drilled the bore hole just beyond the area that would have required the Corps to bring Standing Rock into the environmental justice analysis. It seems Energy Transfer Partners did what it needed to avoid an environmental justice challenge. Still, it was willing to go right up to the line, just 80 yards away, in fact. Questions: What communication happened between the Corps and Energy Transfer Partners regarding the environmental justice analysis? Did the Corps choose this half-mile circle then communicate with Energy Transfer Partners so it would know where to drill? Did Energy Transfer Partners actively lobby for the half-mile impact zone? Did the Corps ask Standing Rock its opinion on the environmental justice analsys? If not, why not? … the Court is hard pressed to conclude that the Corps’ selection of a 0.5-mile buffer was reasonable. DAPL is neither a transportation project nor a natural-gas pipeline; it is a crude-oil pipeline. The [Corps’ environmental analysis] does not identify any project involving a crude-oil pipeline for which a 0.5-mile buffer was employed. Standing Rock is not the only entity to criticize the 0.5-mile-buffer choice. … the EPA [Environmental Protection Agency] advised the Corps that “the area of analysis to assess potential impacts to EJ [environmental justice] communities should correspond to the impacts of the proposed project instead of only the area of construction disturbance. Comment: This is where industry is winning before the public debate even starts. In the case of DAPL, the U.S. Army Corps of Engineers is the lead agency, not the EPA. In Minnesota where Enbridge is seeking approval for an expanded tar sands pipeline through our pristine waters, the Department of Commerce has the lead in creating an Environmental Impact Statement, not the Pollution Control Agency or the Department of Natural Resources. It doesn’t make sense. If there is a major spill, it won’t be Department of Commerce staff out cleaning up the mess. Although this court decision is an important win, things could still unravel. 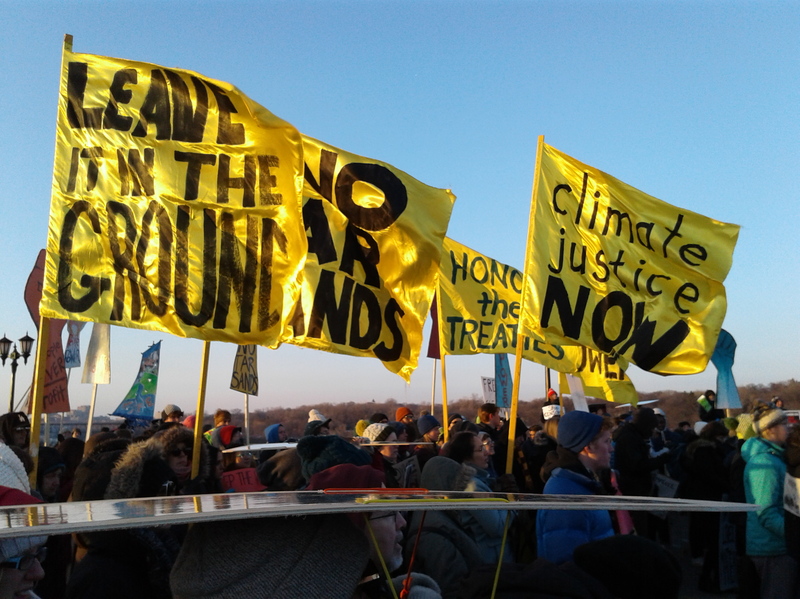 The court does say that the Corps’ analysis “substantially complied with NEPA [National Environmental Policy Act] in many areas.” Will the issue of environmental justice be enough to shut down DAPL? Of greater concern is the court’s writing on treaty rights. Standing Rock may be right that the construction and operation of DAPL under Lake Oahe could affect its members in the broad and existential ways it details, but it offers no case law, statutory provisions, regulations, or other authority to support its position that NEPA requires such a sweeping analysis. Absent any controlling or persuasive authority to the contrary, the Court sees no basis on which to conclude that NEPA demands the type of existential-scope analysis the Tribe advocates. Comment: The treaty itself should be the “controlling” authority. Since the tribe is under federal trust status, the federal government needs to act in the best interests of the tribe. The federal government should be advocate, not adversary. The treaty takes precedence over statutes and regulations, it is the law of the land. Being that the issues in dispute involving the Dakota Access Pipeline are being contested within the ancestral homelands of the Oceti Sakuwin, referenced in the Treaty Stipulations of the 1851,1868 Fort Laramie Treaties with the US Government, should justice be the goal it becomes paramount and inescapable that these Treaty Issues must be first addressed in a competent legal venue of International Law. Any domestic court of the US legal system, or any subdivision of the US government for that matter such as the EPA would simply not have purview over these international issues, as they lie completely within the realm of International Law, and therefore until the 1851, 1868 Fort Laramie Treaties are integrated into the global framework of International Law of Treaties and Agreements on a par as a legitimate International Instrument within the United Nations system, there will never be a chance for the just resolution of disputes among the parties to the Treaty as is now being made visible to the world in the standoff at Standing Rock.